For more than five years, the Rwanda Meteorological Agency (Météo Rwanda) and the International Research Institute for Climate and Society (IRI) have been working together to implement the IRI’s Enhancing National Climate Services initiative (ENACTS) in Rwanda. The ENACTS initiative brings climate knowledge into national decision- making by improving availability, access and use of climate information. Météo Rwanda staff have received a number of trainings on the different aspects of generating the datasets and developing climate information products. However, the tools used to generate ENACTS datasets have been evolving through addition of several new features. As a result, it is necessary to revise the training and to expose the staff to the new version of the tools. On the other hand, Météo Rwanda has started operating a network of automatic weather stations (AWS) and a weather radar. The integration of these datasets to ENACTS datasets is very important to improve the quality of climate data in Rwanda. Thus, the current training activities had three major components: (1) make a full use of the IRI Climate Data Tools (CDT) to create and analyze ENACTS datasets; (2) develop quality control procedures and create scripts to integrate data from the AWS network into ENACTS datasets; and (3) create scripts to process and adjust the radar-based precipitation estimates with data from the AWS network and integrate the processed data into ENACTS datasets. Faniriantsoa, R. 2017. 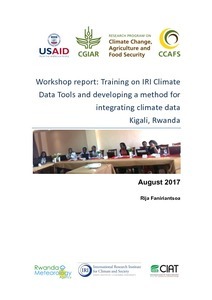 Training on IRI Climate Data Tools and developing a method for integrating climate data in Kigali, Rwanda. CCAFS Workshop Report. Wageningen, Netherlands: CGIAR Research Program on Climate Change, Agriculture and Food Security (CCAFS).